(a) Remove the No. 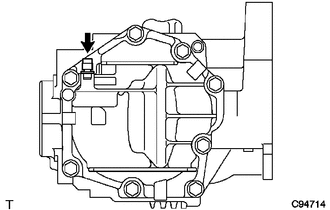 2 transfer case plug. 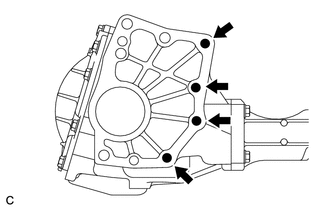 (b) Remove the gasket from the No. 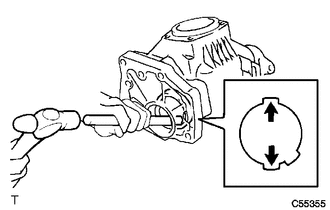 2 transfer case plug. (a) Remove the No. 1 transfer case plug. 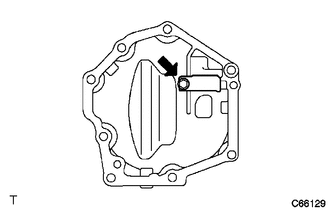 (b) Remove the gasket from the No. 1 transfer case plug. 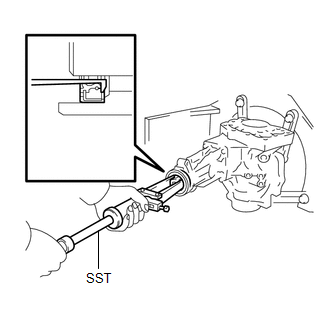 (a) Remove the transfer drain plug. 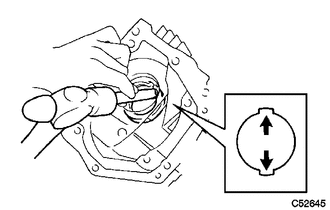 (b) Remove the gasket from the transfer drain plug. 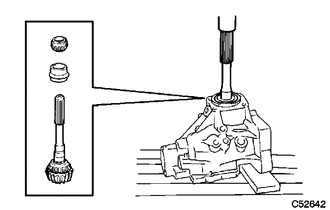 (a) Using a screwdriver, remove the transfer case breather plug. Place the brass bar on the rib protruding from the case. 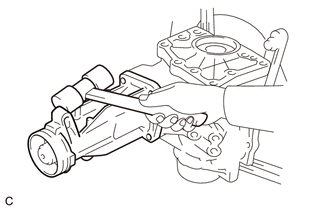 (a) Remove the bolt and breather oil deflector. 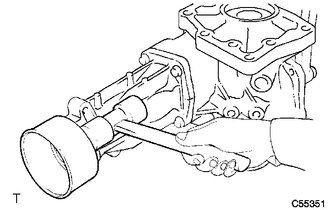 (a) Remove the 3 bolts and transfer dynamic damper from the transfer extension housing sub-assembly. 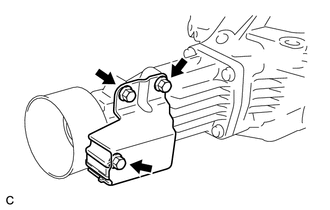 (a) Attach the transfer assembly to an overhaul attachment. 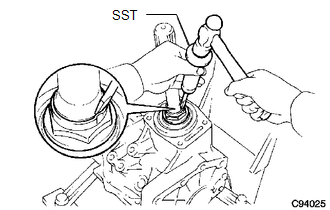 (a) Using SST, remove the transfer case rear oil seal from the transfer extension housing sub-assembly. 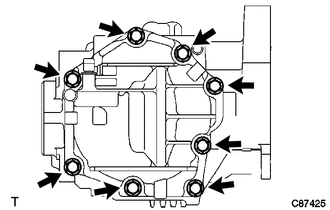 Be careful not to damage the oil seal contact surface or the inside surface of the oil seal. 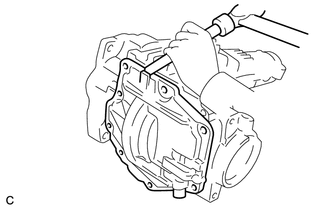 (b) Using a plastic hammer, remove the transfer extension housing sub-assembly from the transfer case. 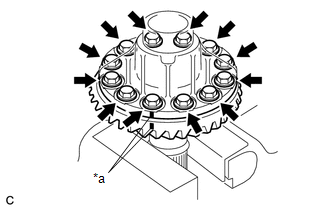 (a) Remove the 2 bolts and bearing cap. 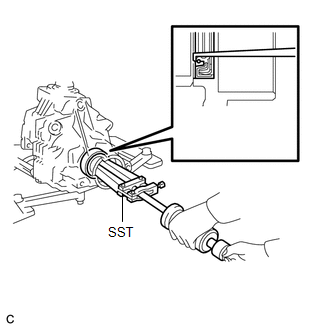 (a) Using SST, a screwdriver and a hammer, remove the No. 1 transfer output shaft spacer. Do not damage the transfer case. 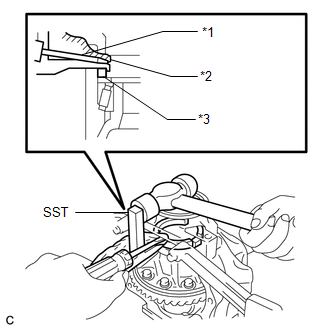 (a) Using SST and a hammer, unstake the gear nut. Use SST with the flat side facing outward. Do not machine the tip of SST with a grinder, etc. 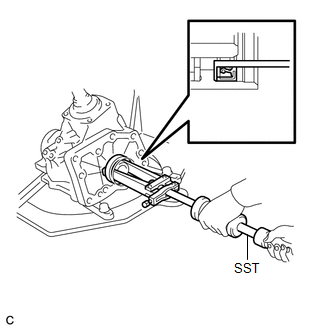 (b) Using SST, remove the gear nut. 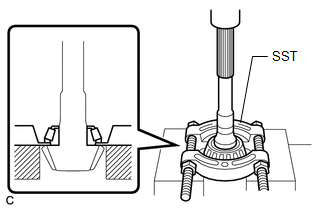 (c) Using a press, press out the driven pinion, transfer driven pinion rear bearing (inner race) and transfer pinion bearing spacer. 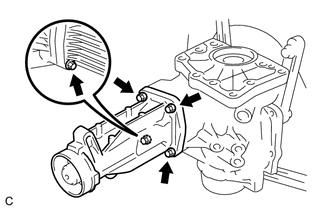 Place a piece of cloth under the transfer case to prevent the driven pinion from dropping out of the bearing. Use wooden blocks or similar objects under the case to keep it level. 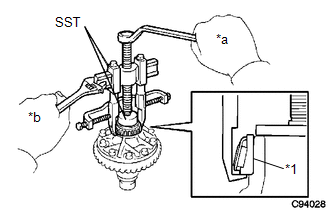 (a) Using SST and a press, press out the front transfer driven pinion bearing (inner race). 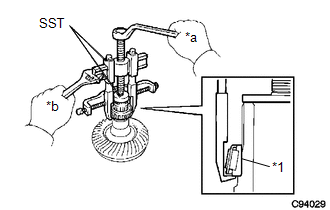 (b) Using a brass bar and a hammer, tap the 2 positions shown in the illustration on the driven pinion front bearing (outer race) to remove it from the case. 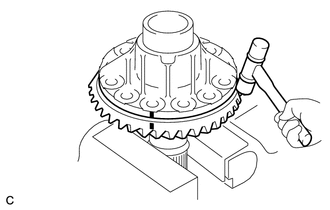 (a) Remove the ring gear mounting case bearing (outer race) from the transfer ring gear mounting case. 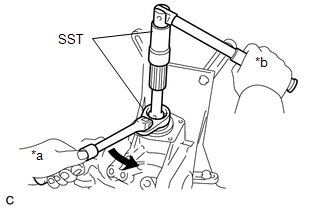 (b) Using SST, remove the ring gear mounting case bearing (inner race) from the transfer ring gear mounting case. Use SST (09953-04020) after applying grease to its threads and tip. 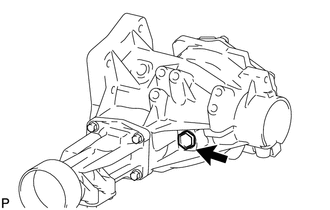 (c) Using SST, remove the ring gear mounting case bearing (inner race) from the transfer ring gear mounting case. 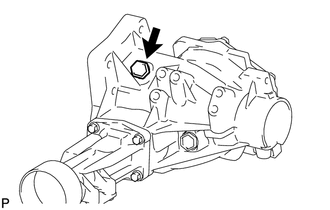 (d) Using a brass bar and a hammer, tap the 2 positions shown in the illustration on the ring gear mounting case bearing (outer race) to remove it from the transfer case. 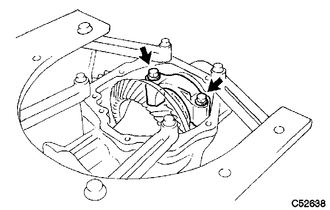 (e) Remove the ring gear mounting case plate washer. (a) Put matchmarks on the transfer ring gear mounting case and ring gear. 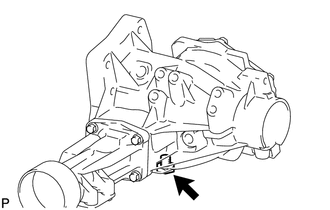 (c) Using a plastic hammer, tap on the ring gear to separate it from the transfer ring gear mounting case. 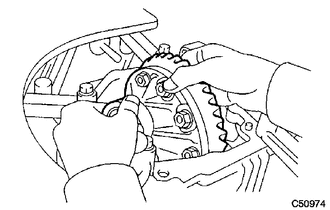 Do not damage the ring gear teeth. 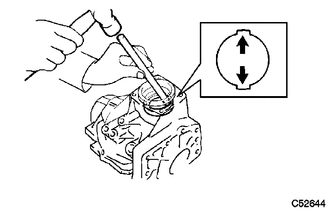 (a) Using a brass bar and a hammer, tap the 2 positions shown in the illustration on the transfer driven pinion rear bearing (outer race) to remove it from the transfer case.